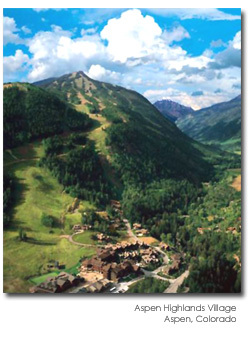 Completed in 2002, Aspen Highlands Village is nestled between the City of Aspen and the wilderness bordering the Maroon Bells and Snowmass Wilderness areas. Highlands is a base camp to ski from in the winter and the backdrop for summer adventure with the feel of a world-class resort. The community comprises exclusive single family estate homes, luxurious townhouses (ranging from 4,2000 to 6,100 square feet) and a Ritz-Carlton Club with 73 units. The design of the village is in harmony with the natural surroundings, defining a unique community of residences with some of the best views in Colorado.